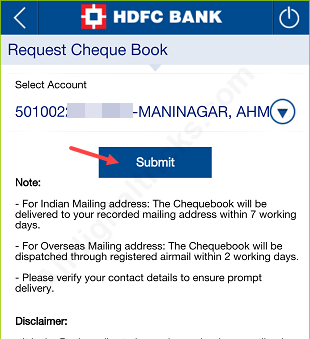 Want to order new Cheque Book for your HDFC saving account?Well, you can request or apply new HDFC Cheque book online, no need to visit bank for this. You will receive your first free Cheque Book when you open new saving/current account in HDFC bank. There is no charge if you order Cheque book with 25 cheque leaves per half-year, however additional cheque book of 25 leaves will be charged at Rs 75 per cheque book. 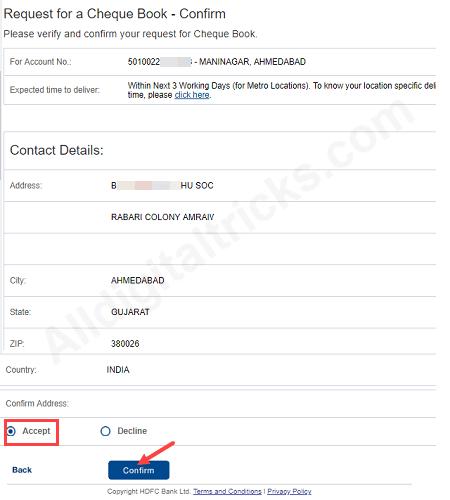 If your Cheque book completed then you don’t need to visit bank for new one, here we will show you 5 online methods to request new Cheque book in HDFC bank. HDFC Bank gives your net banking, mobile banking, missed call banking, SMS banking, phone banking facility for banking services. Many bank related works you can do without bank visit. 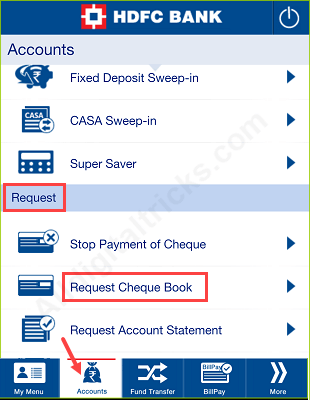 2: After login tap on Accounts tab, and here in Request option tap on Request Cheque Book. 3: Next screen submit your request. That;s it your request submitted successfully. 1: Login to HDFC net banking, enter User ID and IPIN (Login password). 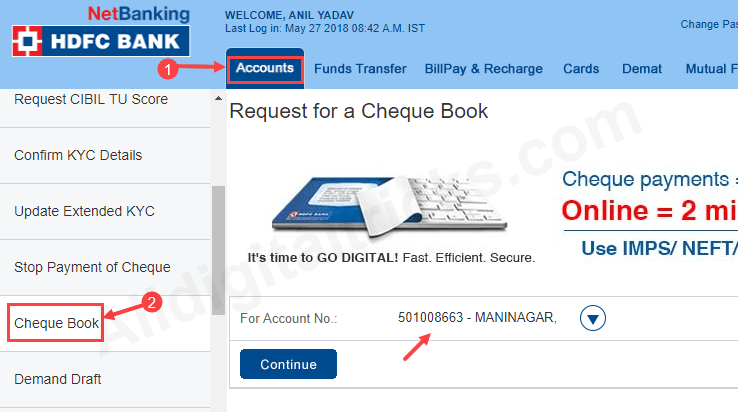 2: After login, click on Accounts, then click on Cheque Book. Select your account number and click on continue. 3: Now confirm your address is correct and click on confirm. Done your request submitted successfully. If you don’t have mobile banking or net banking facility then don’t worry. To order new Cheque book you just need to give a missed call from your registered mobile number and your request will be submitted. After dial this number call will be automatically disconnected. You will receive confirmation SMS shortly. You need to send an SMS from your registered mobile number. And the last option is phone banking. To use this facility please keep your Customer Identification Number & Telephone Identification Number (TIN) or Debit / ATM / Card number & associated PIN ready to access your account. So by following these 5 online methods HDFC customers can request new Cheque book online without visit branch/form filling.